Crowd evacuations are paradigmatic examples for collective behaviour, as interactions between individuals lead to the overall movement dynamics. Approaches assuming that all individuals interact in the same way have significantly improved our understanding of pedestrian crowd evacuations. However, this scenario is unlikely, as many pedestrians move in social groups that are based on friendship or kinship. We test how the presence of social groups affects the egress time of individuals and crowds in a representative crowd evacuation experiment. Our results suggest that the presence of social groups increases egress times and that this is largely due to differences at two stages of evacuations. First, individuals in social groups take longer to show a movement response at the start of evacuations, and, second, they take longer to move into the vicinity of the exits once they have started to move towards them. Surprisingly, there are no discernible time differences between the movement of independent individuals and individuals in groups directly in front of the exits. We explain these results and discuss their implications. Our findings elucidate behavioural differences between independent individuals and social groups in evacuations. 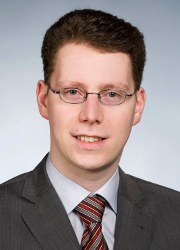 Such insights are crucial for the control of crowd evacuations and for planning mass events. We present a system to conduct laboratory experiments with thousands of pedestrians. Each participant is equipped with an individual marker to enable us to perform precise tracking and identification. We propose a novel rotation invariant marker design which guarantees a minimal Hamming distance between all used codes. This increases the robustness of pedestrian identification. 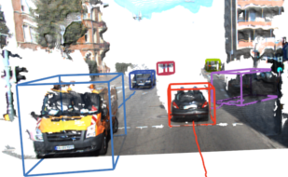 We present an algorithm to detect these markers, and to track them through a camera network. With our system we are able to capture the movement of the participants in great detail, resulting in precise trajectories for thousands of pedestrians. 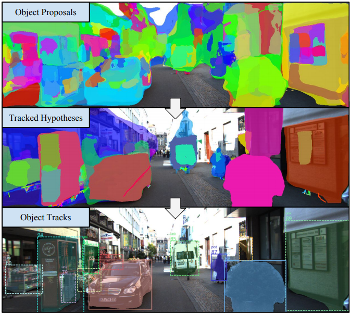 The acquired data is of great interest in the field of pedestrian dynamics. 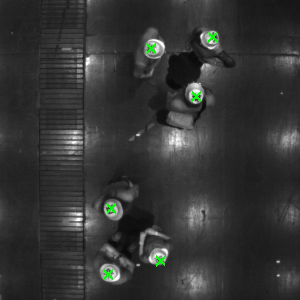 It can also potentially help to improve multi-target tracking approaches, by allowing better insights into the behaviour of crowds. Traffic research has reached a point where trajectories are available for microscopic analysis. The next step will be trajectories which are connected to human factors, i.e information about the agent. 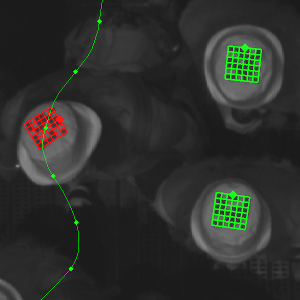 The first step in pedestrian dynamics has been done using video recordings to generate precise trajectories. 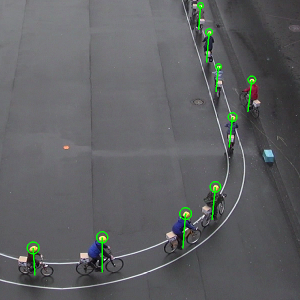 We go one step further and present two experiments for which ID markers are used to produce individualized trajectories: a large-scale experiment on pedestrian dynamics and an experiment on single-file bicycle traffic. The camera set-up has to be carefully chosen when using ID markers. It has to facilitate reading out the markers, while at the same time being able to capture the whole experiment. We propose two set-ups to address this problem and report on experiments conducted with these set-ups. Since the pioneering work of Greenshields the fundamental diagram is used to characterize and describe the performance of traffic systems. During the last years the discussion and growing data base revealed the influence of human factors, traffic types or ways of measurements on this relation. The manifoldness of influences is important and relevant for applications but moves the discussion away from the main feature characterizing the transport properties of traffic systems. We focus again on the main feature by comparing the fundamental diagram of cars, bicycles and pedestrians moving in a row in a course with periodic boundaries. The underlying data are collected by three experiments, performed under well controlled laboratory conditions. In all experiments the setup in combination with technical equipment or methods of computer vision allowed to determine the trajectories with high precision. The trajectories visualized by space-time diagrams show three different states of motion (free flow state, jammed state and stop-and-go waves) in all these systems. Obviously the values of speed, density and flow of these three systems cover different ranges. However, after a simple rescaling of the velocity by the free speed and of the density by the length of the agents the fundamental diagrams conform regarding the position and height of the capacity. This indicates that the similarities between the systems go deeper than expected and offers the possibility of a universal model for heterogeneous traffic systems. The relation between flow and density is an essential quantitative characteristic to describe the efficiency of traffic systems. We have performed experiments with single-file motion of bicycles and compared the results with previous studies for car and pedestrian motion in similar setups. In the space–time diagrams we observe three different states of motion (free flow state, jammed state and stop-and-go waves) in all these systems. Despite their obvious differences they are described by a universal fundamental diagram after proper rescaling of space and time which takes into account the size and free velocity of the three kinds of agents. This indicates that the similarities between the systems go deeper than expected.